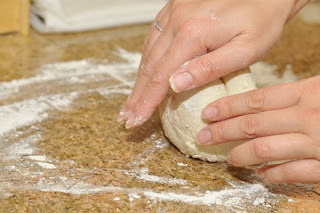 This might be my shortest Daring Bakers post ever. It's just been a crazy busy couple of months and I BARELY got this little guy in under the wire. As you (perhaps) know, I've been traveling. I was gone for about 17 days which truly is a long time in the span of a month! I've been home just over a week and already cooked dinner for people on 3 different occasions! 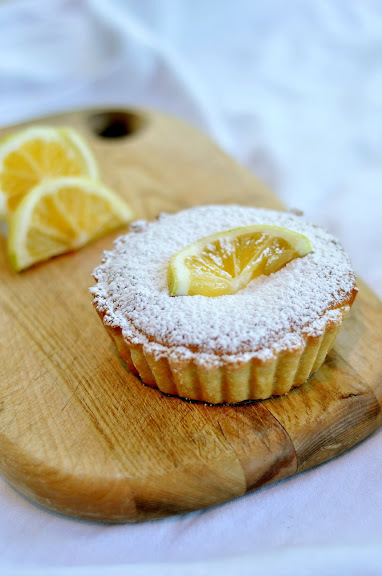 June's Daring Bakers Challenge was: Bakewell Tarts! 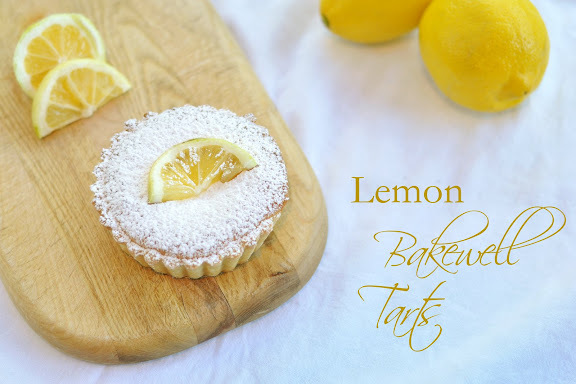 As much as I kept thinking the "Bakewell" part of the name had something to do with how the tarts are cooked -- Baked -- it turns out it's actually the name of the town from which the tarts originated: Bakewell, England. (l) Mom's butter was frozen in 1 pound blocks and I only needed 2T, so I just used my pastry blender with chilled (not frozen) butter ~~~~ (r) And THAT is Mom's scale. 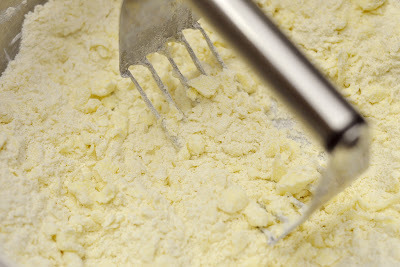 Put it on the weight you need, then add the ingredient until the notches balance evenly. Wow. 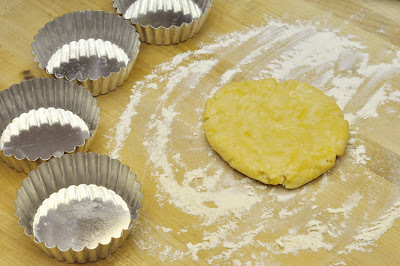 I made only half a recipe which resulted in 4 tarts. I made my favorite lemon curd and made lots of it! I put WAY more curd into the middle than was recommended. I just wanted as little of the almond cake as possible. They look like Chinese dan-tat!! The result was... actually quite decent - which is great! I put A LOT of lemon curd in there. LOTS. So much that I originally thought it wasn't baked all the way through. 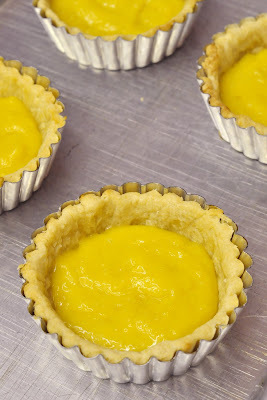 But then I realized the curd had just redistributed as it bubbled and boiled inside the tart. 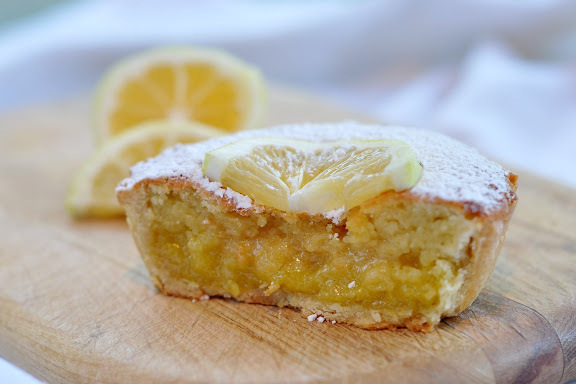 It actually sorta tasted like a big lemon bar! Thanks so much to Jasmine and Annemarie for hosting this month's challenge! Whether I like what I bake or not (and believe me, sometimes I pick out recipes I don't end up liking, also) it's always fantastic to learn about a new food. There are tons more [likely] better Bakewell tarts out there from my Daring Baker friends today. Browse and enjoy! 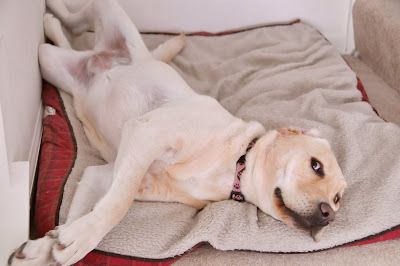 I haven't been on the blog in a while - just wanted to say hi everyone! Our first port was Villefranche, France. I've been to Paris a couple times, but never to the south of France. I was thrilled to get the chance to visit. We had a choice of locales to try and get to from Villefranche: Cannes, Nice, Eze, Monaco/Monte Carlo. All were no more than an hour train-ride away. The best part of cruising is waking up to realize you're in a fabulous, new place! The ship used tender boats to get us into Villefranche's port. No dock large enough for the cruise-ship! Needless to say, Cannes was beautiful. Was with my parents and Auntie Betty today - the other 3 did a less strenuous outing, strolling through Villefranche. Here a yacht, there a yacht, everywhere a yacht-yacht. I got the très importante photo on the steps of the Grand Palais. Angelina Jolie, eat your heart out! We took the train back past Villefranche to Monaco - only about 8 minutes from Villefranche. Hurriedly ran through Monaco with a quick apropos snack. Adorable streets - I loved it! Made the climb up to Prince Albert's Palace. Didn't have enough time to get to Monte Carlo - next time. Instead took the train back to Villefranche to get back on the ship. Later that night, 2 aunties and 1 cousin flew in. And the next morning another auntie arrived (this one pictured is my Auntie Carole, and "Grammy" to the kids). We spent that day back in Barcelona. Auntie Betty, who'd flown in that morning, was a trouper and took off with us for a full day after her arrival that early morning! After a fun day of sightseeing we had a fabulous dinner at a wonderful tapas place called Inopia. The next day we said goodbye to Nicole (and Kenny) and the kids, and got on a shuttle for the port. We climbed onto our home for the next 12 days: Royal Caribbean's Brilliance of the Seas. 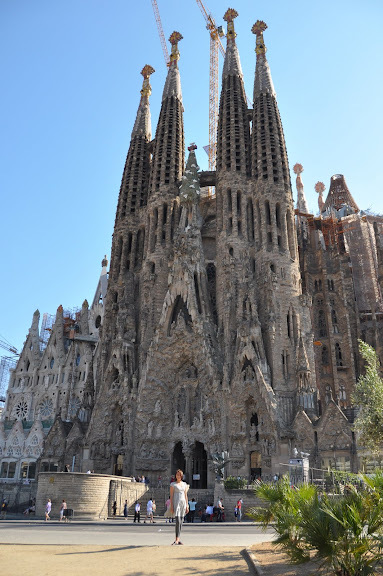 My parents had flown into Barcelona that morning at met us on the ship. All 4 sisters were here now! And we're ready to start cruising the Mediterranean!! Not to mention eat like pigs the entire 12 (+) days! This was my first night. I wasn’t joking when I said “Toodles” to you in my last blog post! I really have not had internet on this trip. I’m currently cruising the Mediterranean Sea. Not too shabby eh? 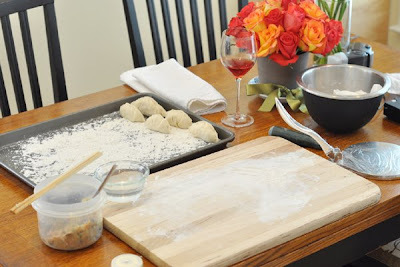 But I did have to purchase myself some internet to get this blog post up – I’m truly a dedicated Daring Cook!! I'm posting now since it's midnight Italy/France/Spain time (I'm somewhere between the 3 countries right now! I was tickled when Jen spilled the beans to us, over breakfast last month, that she was June's Daring Cooks' hostess-with-the-mostess! It was literally hours later that she posted the challenge (from her hotel room nonetheless!) 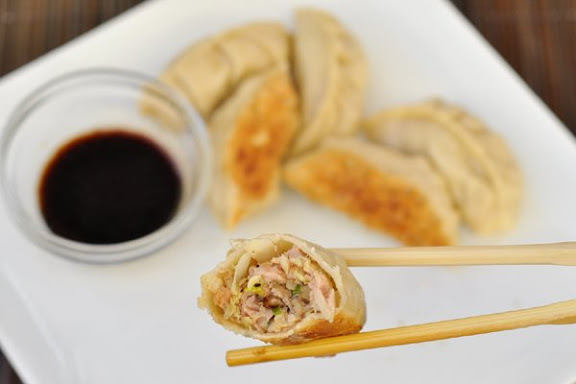 Chinese dumplings! A positively fantastic challenge for Jen to host. 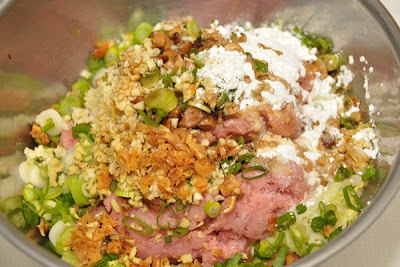 Especially since the main reason I first started reading Jen's blog was for her Fan-Diddly-Tastic Chinese recipes; written out clearly with measurements and instructions. As most children/grandchildren of Chinese immigrants know - when you ask said relatives how to make a particular dish you get what I get from my mother "Oh I don't know, just add it until it tastes right." Which is usually followed by "maybe you should watch me make it and estimate." Neither is very helpful when I'm on the other end of a phone call inquiring about a tricky Chinese recipe. 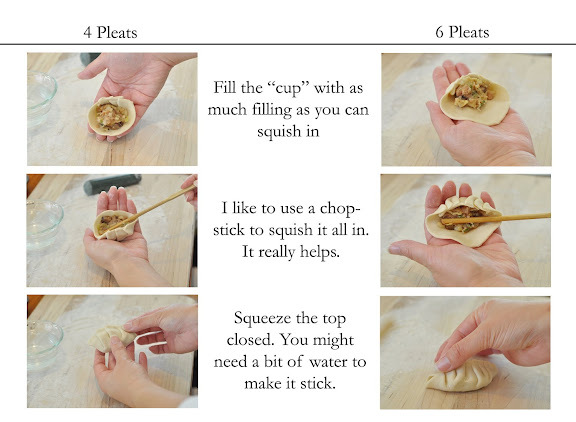 First things first here, the difference between a dumpling and a potsticker is... nothing other than how you cook it. 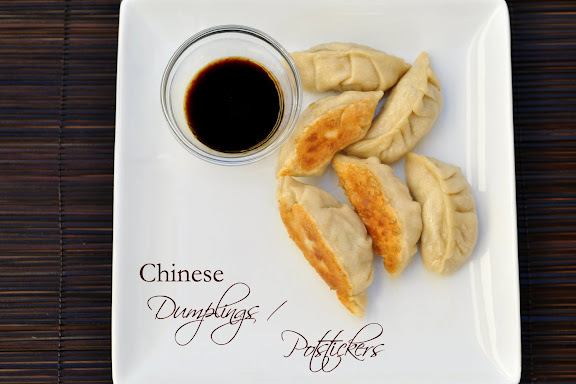 Dumplings are usually boiled or steamed while potstickers are pan-fried. Other than that they are the same thing. 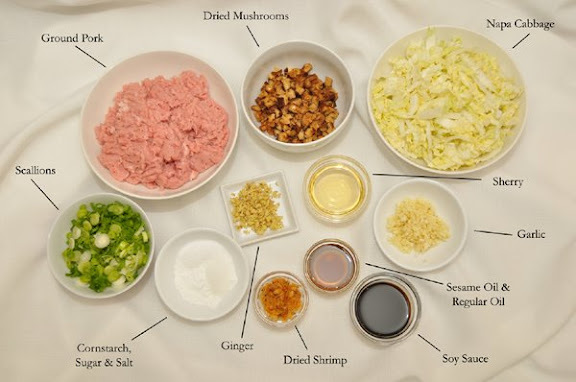 We were given Jen's entire recipe for dumpling skins, fillings (1 pork and 1 shrimp) and a dipping sauce. 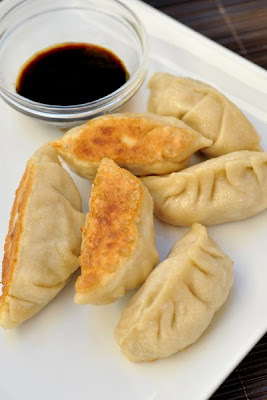 As I reviewed her recipe however, I realized that it was quite close to my family's dumpling/potsticker recipe; right down to the dipping sauce! So I pretty much made my family's recipe since it's what I'm familiar with. 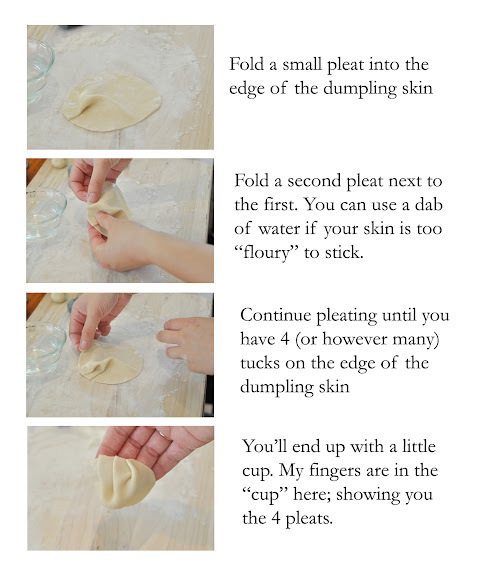 I did do a version of Jen's dumpling skin to check it out first, but lemme tell you - our family recipes for all the elements of this challenge were near identical, so I probably won't even get a slap on the wrist for using my own. 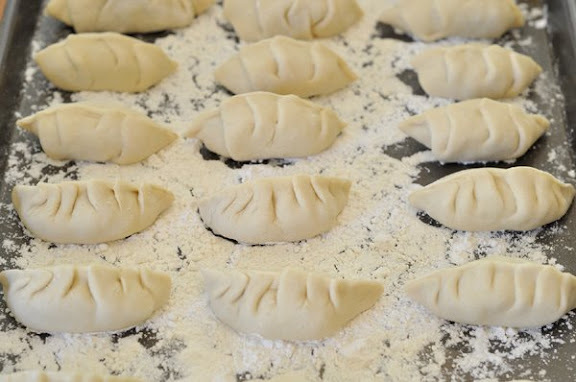 My potsticker folding station – not a bad thing to do on a Saturday afternoon! My family uses more water than Jen in the dumpling skins. 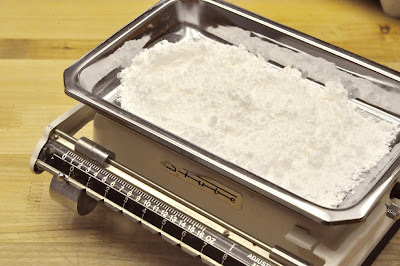 6 T of water per 1 cup of flour, while Jen uses 4 T of water per 1 cup of flour. 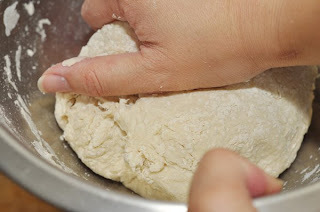 I don't know whether this was something with my weather, or the day, or my skill after practicing, but I liked the dough better with more water. 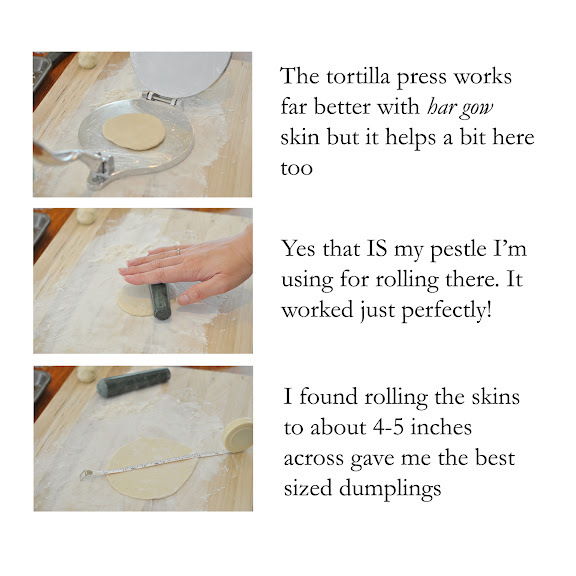 After cooking, the skin felt softer and thinner even when I rolled them out the same thickness. The family filling differs a bit as well but really you can throw anything into a dumpling and it’s legit if you enjoy it. My filling layout - I had no idea I had so many small dishes! Ha! 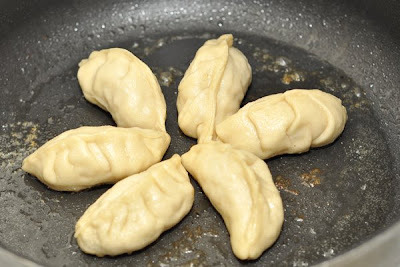 My auntie taught me to fold dumplings differently also. 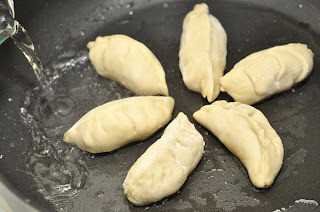 I’ve put together a step-by-step to show people how we fold dumplings in my family. 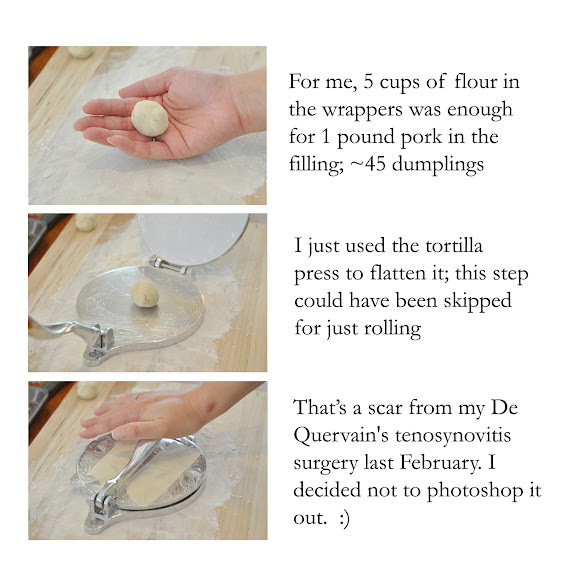 I also tried Jen’s way and while her way seems easier to do, I think our way allows you to stuff more filling in the dumplings. Pick your priorities! We fold ours with either 4 folds or 6 folds depending on how intricate you want to be. The other thing that’s nice is you could fold (for example) shrimp with 4 pleats and pork with 6 and then you can tell the difference without having to keep them separated. I’ll post higher resolution pictures when I get home so that you can see better details when you click on them – I’m currently traveling and the bandwidth is very low so I can’t upload large images. Cooking the dumplings is so easy and fast. Just fry the bottoms up a bit and then dump in the water while it splatters and splashes and steam them until the water’s gone. After all that complicated slicing, dicing (the filling) and folding (the dumplings) it’s nice that cooking is so simple and easy. 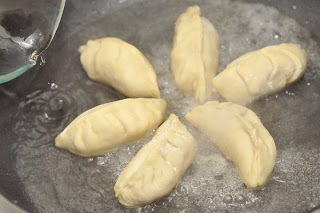 And of course that’s for potstickers; dumplings are just as easy – either boiling for soup or steaming gently to eat with a dipping sauce. Look at that water sizzle and splatter! WOW - back up! There will be lots more of these sooner than later; lots! It’s always scary to set up for and make these “complicated” things I’ve learned from my family; and do so all alone at home. 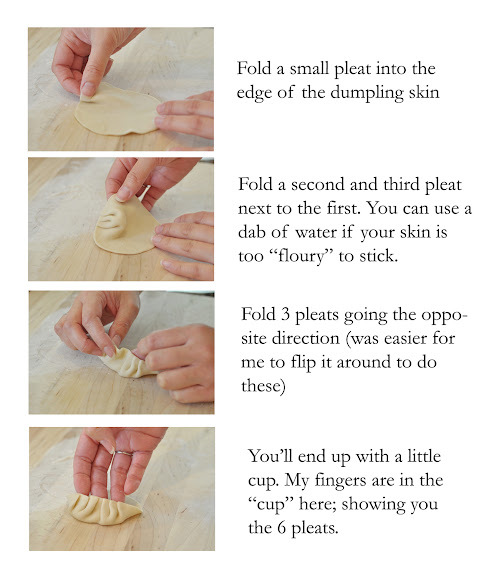 It’s so much more fun and less-intimidating to do them with a small army of Chinese females gathered around me instructing [demanding] that I fold my dim sum the correct way. But these relatives are aging much faster than I’m willing to accept. 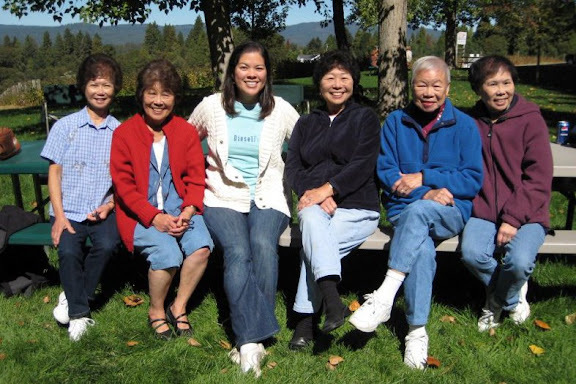 In fact, my mom’s oldest sister, my Auntie Frances who has been like a pseudo Por-Por to me (my own passed away many, many years before I was born) taught me to make almost all the Chinese food I make. Her health and age have now carried her to a point in which she’s no longer cooking very much anymore. It is to her that I dedicate this post, and to Jen I send my thanks - for pushing me and reminding me that I can make these things. And in doing so, I can carry on the family traditions for many, many, many more years.